Green idealists fail to make the grade. The people that recycle the most are also the most likely to cause serious environmental damage by taking long haul flights when holidaying abroad. Is the equation relating atmospheric quantities? Any of you know? Check out Smith's other work. You might enjoy it as much as I did. Hello Lee, the equation just spells out the word 'holiday'. 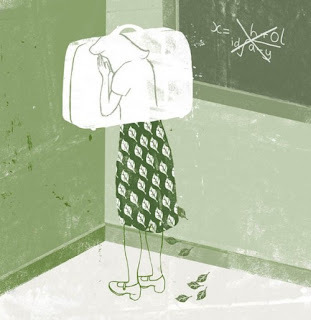 The idea behind having the girl stand in the corner of the room was meant to suggest a dunce standing in the corner of a classroom, the suitcase acting as a kind of dunce's hat and the equation for this kind of holiday being crossed out on the blackboard. Nice bit of investigation, Lee! I feel dumb now that I didn't even realize it spelled 'holiday' though.